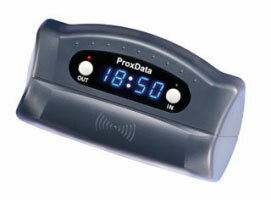 The TR-515 is a modern online time clock terminal with Ethernet interface. Reasonably priced, it is a cost-effective alternative to expensive high-end terminals while still supporting all major functions of a modern time clock terminal. The device is available in three different versions. You can choose among bar code, magnetic stripe or RFID reading units. As it is directly connected to your computer network and offers various related functions, it is the perfect choice for time clock applications in medium-sized and large enterprises. Connect the unit to your computer network or a PC using an Ethernet cable. An external 9V AC adaptor for power supply is included in the package. Use the setup software, then allocate an IP address to your terminal and set a unit ID to distinguish it from other units in the same network. The device is now ready-to-use and can be installed immediately. A drilling template makes installation on walls or tables easy. The TR-515 can also be installed upside-down, if required for ergonomic or installation reasons. In this case, you may use the included upside-down display labels. The display itself can be turned by 180 degrees using the software setup. Use the TR-515 software manager to control all functions of the TR-515 from any PC located in the same network. For example, you can configure how registered user data is transmitted automatically in intervals, manually, by email. Intervals and individual transmission points can be software configured. Two data formats are available - choose between ASCII text and CSV files. The database structure is really simple terminal ID, transponder ID, event IN or OUT, date and time. Additionally, you will have the opportunity to limit the ID length to a fixed number of characters. The device can use up to fifteen decimal places of the transponder. Relay switches automatically opening doors after ringing the bell and event configuration e.g. event IN only within 0800-1000, event OUT only within 1745-1930 saves time for all users, as cumbersome key presses become irrelevant. All commands, functions and protocols are described in detail in the included manual. Provided with the unit are the TR-515 software manager, two display masks, two connection cables, one installation kit, an AC adaptor and a drilling template. A cable covering is optionally available.